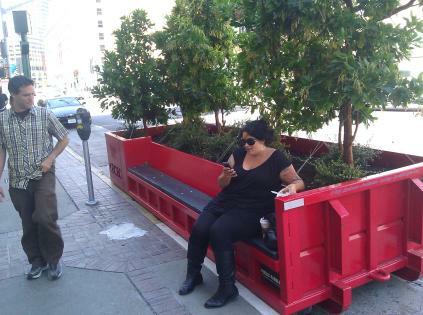 Here in SF we have an ongoing program of creating public outdoor spaces in what was previous a parking space. Fabric 8, an art gallery and clothing store, just finished their parklet which was created by Eric Otto. Looks cool... nothing like The Chronicle's horrible dumpster looking thing. Fabric 8's new parklet created by SF artist Eric Otto.